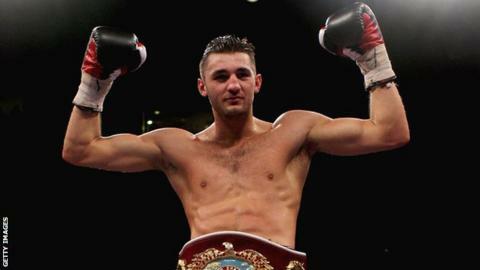 WBO light-heavyweight champion Nathan Cleverly will face undefeated American Ryan Coyne in his fourth title defence. The 25-year-old Welshman was set to fight Ukrainian Vyacheslav Uzelkov in Cardiff on 27 October. But Cleverly will now fight in Los Angeles on 10 November on a card alongside WBC super-bantamweight champion Abner Mares and IBF bantamweight champion Leo Santa Cruz. "It's a good fight for me to look good and make a statement," Cleverly said. "I love fighting unbeaten fighters because it's that extra incentive, that extra motivation. "To have two unbeaten guys in the ring and both fighting to avoid their first loss, it just makes it more challenging and a victory after that is more special. "I've done it five times before against unbeaten fighters and I'm going to make it six times." Former college American Football player Coyne, 30, has won 21 of his 22 fights with one no-contest and has held the WBC United States cruiserweight belt. The match between Cleverly and southpaw Coyne, whose nickname is the Irish Outlaw and featured on US boxing reality show The Contender, is subject to sanctioning by the WBO. Coyne is not ranked in the WBO's top 15 fighters behind champion Cleverly - Uzelkov is at number seven - but the WBA does have the Missouri native at 10, while the WBA has him as the second-ranked contender. "It's a dream come true to defend my world title in America," Cleverly added. "On such a big show it takes my career to a whole new level, it's a golden opportunity to make a big statement that I'm the leading man in the light-heavyweight division. "It will be exciting and challenging to get the recognition of the American fans and media and prove to them that I'm the real thing. "Of course, I love fighting and headlining in front of my Cardiff home fans, but this shows that I'm not scared to leave my home comforts and risk my title by putting it on the line in another country, that's what being a world champion is all about, I relish the challenge. "It's a big test in my career, but I'm ready and won't be overawed. I think that this will give my performance a sharper edge because I'm not at home and the pressure to perform will be on me." Cleverly is keen for unification fights with WBA light-heavyweight champion Beibut Shumenov and IBF light-heavyweight champion Tavoris Cloud and hopes his American trip to fight at the Staples Center will put pressure on them to agree to face him. "I'm close, I'm just round the corner really from one of those big fights, so it's important not to slip up," Cleverly added. "This next fight is... probably one of the most important of my career because I need to win, I need to look good and impress. "Provided I do those things the unification fight is going to happen. This is very important. "We've been trying hard to get Shumenov and Cloud to come over here and fight me but they've been reluctant to make the trip, so if they won't come to me I'll go over there and fight them. "I'll go to their own territory and embarrass them into facing me." American great Bernard Hopkins and IBF super-middleweight champion Carl Froch - who would have to face Cleverly at a catch-weight - have also been approached as potential opponents. While Cleverly's proposed defence against Uzelkov at the Motorpoint Arena in October now off, his promoter Frank Warren indicated that the venue could be used for another title defence in early 2013, assuming the Welshman sees off his opponent in Los Angeles. The two chief-supporting title fights that had been scheduled for the Cardiff card, Junior Witter v Frankie Gavin for the British welterweight championship and Ovill McKenzie v Enzo Maccarinelli for the Commonwealth light-heavyweight championship have been rearranged. Witter v Gavin will now headline a promotion at the York Hall Bethnal Green on Thursday 1 November, while McKenzie v Maccarinelli has been added to the Queensberry Promotions show on Friday 9 November at the Liverpool Olympia as chief support to the clash between Paul Butler and John Donnelly for the vacant British super-flyweight belt. Warren said: "I'm delighted that Nathan has got the opportunity to showcase his talent in America at this stage of his career. He's eager to show the American fans what he's made of and a win will set up big unification fights next year." Cleverly has also indicated he would like to use Cardiff City Stadium, the home of the Cardiff City Football Club he supports, as a venue for a title defence sometime in summer 2013, while with the right opponent in place the national Millennium Stadium in Cardiff could be a possible venue.